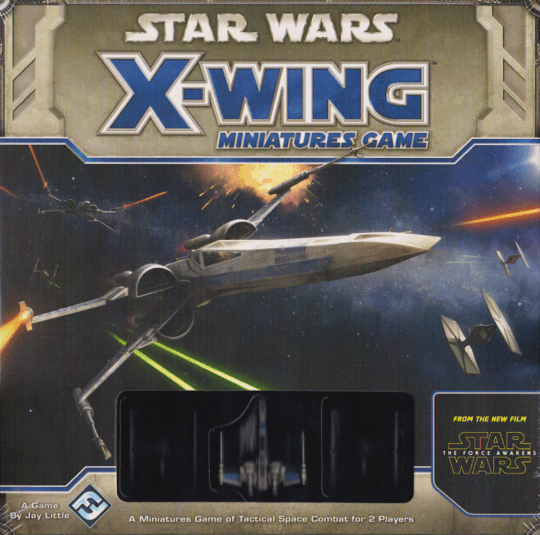 From the publisher: Featuring beautifully detailed painted miniatures, X-Wing is a two-player game of dramatic starfighter battles set in the Star Wars universe. You and your opponent take command of Resistance X-wings and First Order TIE fighters, then battle head-to-head for the fate of the galaxy. Secretly plot your maneuvers, fly at your enemies, take aim, and fire. It takes just minutes to learn the rules, but the nearly limitless possibilities for squad building, along with the ability to expand your fleet with other ships from the game’s expansions, ensure that you’ll find plenty of Star Wars action to explore and enjoy for years to come! X-Wing is a two-player miniatures game of fantastic, high-speed dogfights. Now, for the first time, you can enjoy these dramatic space battles with the incredible new starfighters from The Force Awakens! The Force Awakens Core Set is the heart of your X-Wing experience and contains everything that you and a friend need to start playing, including three painted plastic ships – one Resistance T-70 X-wing and two TIE/fo fighters.